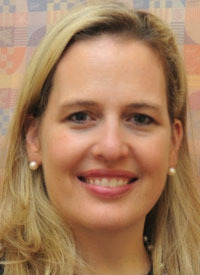 Interim survival data from the intent-to-treat population of the placebo-controlled phase II LOTUS study showed a median OS of 23.1 months in the arm randomized to ipatasertib plus paclitaxel compared with 18.4 months in the arm randomized to placebo plus paclitaxel, said Rebecca Dent, MD. The survival data are consistent with an improved progression-free survival (PFS) with ipatasertib in previously released data from LOTUS.2 The median PFS in the ITT population (n=124) was 6.2 months in the ipatasertib arm versus 4.9 months in the placebo arm (stratified HR, 0.60; 95% CI, 0.37-0.98). In the subset of patients with PIK3CA/AKT1/PTEN-altered tumors (n=42), the benefit of ipatasertib on median PFS was more pronounced compared with placebo (9.0 months vs. 4.9 months, unstratified HR, 0.44; 95% CI, 0.20-0.99) in a prespecified analysis, announced Dent, Senior Consultant, National Cancer Center, Singapore. Ipatasertib is an ATP competitive inhibitor of AKT. The PI3K/AKT/mTOR pathway is activated in about 40% of TNBCs. “This is a key survival pathway. What we know is that it’s involved in key cellular processes: metabolism, motility, proliferation, and growth,” said Dent. The PI3K/AKT survival pathway is activated in response to chemotherapy. Increasing exposure to docetaxel induces increasing phosphorylation of AKT. In PI3K TNBC mutant cell lines, the addition of ipatasertib to docetaxel is synergistic in causing cell death. Studies of allosteric AKT inhibitors were associated with considerable gastrointestinal toxicity that limited their development in the clinic. Ipatasertib inhibits AKT1, AKT2, and AKT3 and has greater therapeutic window. Patients eligible for LOTUS had previously untreated measurable mTNBC not amenable to curative resection. They had to have been at least 6 months removed from chemotherapy in the adjuvant setting. Archival or newly obtained tumor tissue was contributed for central PTEN assessment. Patients were randomized 1:1 to paclitaxel at 80 mg/m2 on days 1, 8, and 15, with either ipatasertib at 400 mg/day or placebo on days 1 to 21 of a 28-day cycle until progression or unacceptable toxicity. OS was a prespecified secondary endpoint. Two thirds of patients had prior taxane treatment and about three fourths had either lung or liver metastases. Ipatasertib improved the overall response rate in the ITT population from 32% to 40%; in the PTEN-low subgroup from 26% to 48%; and in the PIK3CA/AKT/PTEN-altered tumor population from 44% to 50%. “Most noticeably, we see an almost doubling of the duration of response with the addition of ipatasertib, from 6.1 to 11.2 months, in the biomarker next generation sequencing (NGS)-altered tumor group,” she said. The OS results presented here represent about 50% of OS events in both arms. The stratified HR for OS in the ipatasertib arm relative to placebo was 0.62 (95% CI, 0.37-1.05). The 1-year OS rate increased from 70% to 83% with the addition of ipatasertib to paclitaxel. When OS was stratified by immunohistochemistry PTEN status, “whether you were PTEN low or PTEN normal, there appears to be a trend towards improvement with the addition of ipatasertib,” said Dent, with no different in effect between the PTEN-low and -normal groups. The median OS in the PTEN-normal cohort was 18.6 months in the placebo arm versus 28.5 months in the ipatasertib arm (unstratified HR, 0.56; 95% CI, 0.26-1.23) with a 1-year OS rate of 68% and 85%, respectively. In the PTEN-low subgroup, median OS was 16.1 months in the placebo arm and 21.8 months in the ipatasertib arm (unstratified HR, 0.86; 95% CI, 0.40-1.83), with a 1-year survival rate of 64% and 79%, respectively. When analyzed according to PIK3CA/AKT1/PTEN status by NGS, in the non-altered subgroup, median OS improved from 16.2 months in the placebo arm to 23.1 months in the ipatasertib arm (unstratified HR, 0.65; 95% CI, 0.32-1.30), with a 1-year OS rate of 70% and 81%, respectively. In the biomarker-altered subgroup, median OS was not evaluable in the placebo arm and was 19.7 months in the ipatasertib arm (HR, 0.90; 95% CI, 0.38-2.15), with a 1-year OS rate of 63% and 88%, respectively. The small number of patients and few number of events in the biomarker-positive cohort prevents drawing definitive conclusions about outcomes in this group, said Dent. Ipatasertib was well tolerated, but a substantial increase in the incidence of diarrhea was observed with the AKT inhibitor generally during the first cycle of treatment. Diarrhea mostly resolved with ipatasertib dose reduction or the introduction of loperamide. Even with dose delays/interruptions due to diarrhea, “we did not see any difference in dose intensity between these 2 arms,” she said. Use of subsequent anti-cancer therapy was similar between the ipatasertib and placebo arms (76% and 89%, respectively), as was use of subsequent immunotherapy (11% in both arms). Final OS results are expected in 2019, said Dent. The findings support further evaluation of first-line ipatasertib plus paclitaxel for mTNBC in the ongoing IPATunity130 randomized phase III trial. Dent R, Im S-A, Espie M, et al. Overall survival (OS) update of the double-blind placebo (PBO)-controlled randomized phase 2 LOTUS trial of first-line ipatasertib (IPAT) + paclitaxel (PAC) for locally advanced/metastatic triple-negative breast cancer (mTNBC). Presented at: 2018 ASCO Annual Meeting; June 1-5, 2018; Chicago, IL. Abstract 1008. Kim SB, Dent R, Im SA, et al. Ipatasertib plus paclitaxel versus placebo plus paclitaxel as first-line therapy for metastatic triple-negative breast cancer (LOTUS): a multicenter, randomized, double-blind, placebo-controlled, phase 2 trial. Lancet Oncol. 2017;18:1360-72. doi: 10.1016/S1470-2045(17)30450-3.